Can Tax Debt Be Discharged Through Bankruptcy? Are you eligible for tax forgiveness for back taxes owed to the Internal Revenue Service (IRS)? Many people believe that tax debt cannot be discharged through bankruptcy, but that is false. Filing bankruptcy may help you discharge back taxes, interest, and penalties. Do you qualify for tax forgiveness? Our Dallas bankruptcy attorneys can help you determine your eligibility. Call Allmand Law Firm, PLLC today at 214-884-4020. How Can I Discharge Tax Debt? While it is true that many tax debts cannot be eliminated through bankruptcy; however, some can. Even those that cannot be completely discharged may be negotiated for lower amounts with the government or included in a manageable payment plan. If you want to know more about tax forgiveness, contact our bankruptcy attorneys today. Tax debt must be at least three years old before filing. Debt must be assessed by the IRS at least 240 days prior to filing. Tax return must have been on file for at least two years. The taxes must be income taxes (payroll taxes and fraud penalties are not dischargeable). You did not commit fraud or willful evasion of taxes. Tax forgiveness has many requirements, but is a benefit of bankruptcy that many people do not consider. If you have questions about how to discharge tax debt, a knowledgeable attorney can help. Can I Eliminate a Federal Tax Lien on Property? Even if your tax debt is dischargeable, prior federal tax liens on personal property may still be a problem. Chapter 7 may be able to eliminate your tax debts if they meet all of the prior stated requirements. However, if the Internal Revenue Service (IRS) recorded a lien on your property prior to your filing bankruptcy, that tax lien will remain. Although you may be able to keep the property, you will not be able to sell it with a clear title. Before you sell the property, you will have to pay the tax lien. What Types of Tax Debt May Not Be Discharged? Tax refunds that were erroneously paid to you. Other taxes related to your business and nondischargeable funds. It can be difficult to know if your tax debt is eligible for tax forgiveness. A skilled lawyer can look at your taxes and let you know if they can be discharged. Even if you do not qualify for tax forgiveness, a tax lawyer can help you manage the legal aspects of your case and deal with the IRS for you. Provided that your tax debt meets the requirements to be discharged, you may be eligible to file under Chapter 7, Chapter 11 or Chapter 13. In Chapter 7 bankruptcy, an “automatic stay” is enacted which immediately stops creditor collections. Debt should be discharged about 90 days after the case is opened. Only after debts are discharged can the IRS pursue collection. However, you may be able to eliminate the tax debt through discharge, stopping the IRS from collection efforts. During the interim, you can plan for repaying any debt that is not discharged. Chapter 13 bankruptcy, or “reorganization bankruptcy,” gives you time to repay what you owe in smaller amounts. Some debts can be discharged through Chapter 13 bankruptcy as well. Make sure you choose the right bankruptcy solution for tax forgiveness by speaking to a lawyer today. When you file Chapter 7 or Chapter 13, the court will issue an order calling for an “automatic stay.” This stops creditors, including the IRS, from harassing you for your debts. They are no longer allowed to send you letters, garnish wages, pull funds from your bank accounts, file liens against your property, and call you on the telephone. A stay may only be lifted by creditor request and for good reason. 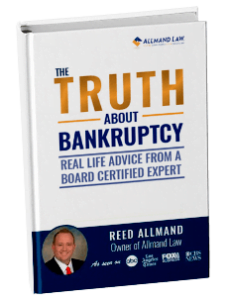 Reasons may include incurring debt after you filed bankruptcy, you have filed multiple bankruptcies, or you engaged in fraudulent activity. The automatic stay will be in place throughout your bankruptcy procedures. Your creditors may only contact your lawyer or attend the Meeting of Creditors to address you in person. After your bankruptcy has concluded, your creditors, including the IRS, may resume collection procedures. However, if you obtained tax forgiveness through a discharge of what you owed, the IRS will no longer pursue you for past due taxes. What Happens to Tax Debt That Is Not Discharged? Not all income taxes are eligible for tax forgiveness or discharge. If you have tax debt that is not dischargeable, you may have to deal with it in a different manner. A tax forgiveness lawyer can evaluate your situation and help you understand your options. If you filed Chapter 7 bankruptcy, you will have an automatic stay to stop IRS collection processes during the bankruptcy. However, between three months and six months later, when the case has concluded, the IRS may resume collection efforts. Any taxes that were not discharged may be negotiated with the IRS or a payment play may be established. A skilled bankruptcy attorney can help you with IRS tax debt that is not eligible for tax forgiveness. If you filed Chapter 13 bankruptcy, your nondischargeable tax debt may be managed through your payment plan. Chapter 13 utilizes a three- to five-year payment plan to reorganize your debt. Any tax debt that is not eligible for tax forgiveness may also be included in that payment plan. Speak with our bankruptcy attorney in Dallas, Texas about the options best-suited for your situation. We can work with you find a way to help you resolve tax liens, wage levies, and even to remove existing tax liens. We’re here to guide you through this process. Schedule a free consultation to discuss your debt relief options. We’ve helped tens of thousands of clients resolve their debt, and we’re ready to help you too. You can reach Allmand Law Firm, PLLC at (214) 884-4020 – give us a call today!